Scones! I'm in love with those treats ever since I first had them (what is not so long ago, because Scones are not very usual in continental Europe. First scone-experience: February 2010, NYC. No Joke!). And I can't say it often enough: I'm pretty happy we have so many breakfast treats left to bake. I strongly belive that there are people who make wonderful, exciting cakes and there are people who are good in baking "dry stuff" like bread, Viennoisserie, scones and biscuits. Maybe simple cakes, too. No, I know, these things are not really "dry" at all. It's just to describe the difference to creamy cakes. Guess I am the second kind of person. I followed the recipe for Cream Scones just as written in Dorie's book on p. 12 - you can find the recipe on Lynne's page "Cafe LynnyLu", too. She picked this easy, fast and at the same time great recipe for this week's TWD! The heavy cream gives the rceipe a special touch. But: I was wondering, where the raisins come in? Must have a blind spot or anything.Well, I changed them for dried apricots, anyway, because I LOVE dried apricots and could not imagine rasins in these. P.S. : If anybody knows the "flowers" in the picture - that gives an extra 10 points for beeing a bloomer-nerd! Found them at my market. I once read about this plant, because it has the same name as an cookbook-author, but this was in a spice-context - so I would never have expected them to be sold at the flower stand! 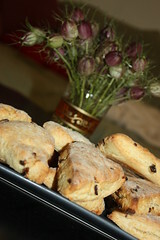 I'm drawing a blank on the flower, but the scones look delish. 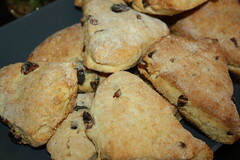 If you start your day with a scone it has to be good! These look so delicious. 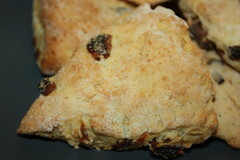 I never knew much about scones but I will be making these again. Love the apricots in yours. i will be making this againa nd again too. I've had many scones in England (my husband is British) but I suspect that have many other treats in Europe to enjoy. I like baking all the breakfast treats, too. Scones are my favorite breakfast treat and have been for years. THose look perfect.